The objective of this study was to review the patients’ characteristics and surgical findings of surgically excised abdominal wall endometriosis (AWE) cases. We retrospectively analyzed the medical records of patients diagnosed with AWE between 2005 and 2015. Descriptive data were collected and analyzed. Sixty-six patients with histopathological diagnosis of AWE were included in our study. The mean age was 32±6.8 years and all cases were multiparous. All patients had a history of previous abdominal surgery and 63 patients had a history of cesarean delivery. The primary symptom was a painful palpable mass. The excised mass was generally on the previous surgical scar. The excised mass location was observed as subcutaneous tissue, fat layer, fascia and muscle tissue. There was no statistical correlation depth of invasion and mass size with the number of previous surgeries. Caesarean incision was considered as the most important predisposing factor for AWE. As caesarean rates are increasing, we believe that the incidence of AWE will increase in the future. For this reason, more prospective studies are needed for prognosis and prophylaxis of the disease. Endometriosis is deﬁned as the presence of endometrial glands and stroma outside the lining of the uterine cavity (1). Endometriosis is often found in intrapelvic areas such as ovaries, posterior cul de sac, ligaments of uterus, pelvic periton, rectovaginal septum, but it may rarely be in extrapelvic regions such as urinary tract, gastrointestinal tract and thorax (2,3). The abdominal wall endometriosis (AWE) is an uncommon clinical entity with a reported incidence of 0.03-3.5% (4). This condition may develop spontaneously, however, the most important risk factor is previous surgeries (5,6). The purpose of our study was to investigate the demographic characteristics, surgical history, symptoms, diagnostic methods and intraoperative findings of patients with AWE and to make proposals for implementation. This is a retrospective descriptive case study. We reached the records of patients between November 2005 and March 2015 who had definitive histopathological diagnosis of AWE or scar endometriosis after surgical resection. Age, gravidity, parity, surgical history and characteristics of patients, diagnostic methods, and characteristics of the masses (e.g. number, localization, associated anatomical structures) were recorded. The time interval between the previous surgery and the diagnosis of AWE was defined as the “recognition period”. Patients with intraabdominal organ endometriosis were excluded from study. This study has been approved by İstanbul Training and Research Hospital Ethics Committee (decision no: 649, date: 15.05.2015). Every patient admitted to our clinic had signed informed consent for admission and we are allowed to investigate clinical data unless we use personal data. Statistical analysis was performed using SPSS for Windows version 15.0. Descriptive statistics were reported as number and percentage for categorical data, and mean, standard deviation, minimum and maximum for numerical variables. The trend for rate increase was examined with Mantel-Haenszel linear-by-linear association in chi-square test. Statistical significance level was considered as p<0.05. Sixty-six patients with histopathological AWE were included in our study (Table 1). The mean age was 32±6.8 years. All cases were multiparous. The recognition period for AWE ranged from 2 to 24 years. Majority of the patients had a history of cesarean delivery. Almost all of the patients had Pfannenstiel incision scar. Major presenting symptoms were palpable mass and pain. Ultrasonography (US) (44%), magnetic resonance imaging (MRI) (12%), computed tomography (CT) (4.5%) and fine-needle aspiration (FNA) (20%) had been performed for preoperative diagnosis. Thirteen of the patients (20%) had no preoperative diagnostic procedure and the masses were detected incidentally. The masses were mostly located at the previous surgery scars. In five patients, the masses were at umbilicus and far from previous scar. Sixty-nine percent of the masses were located at the incision corners. The endometriotic masses were mostly located in the subcutaneous tissue (45.5%). The mean mass size was 28.7±10.4 mm. The masses were completely excised in all patients. Polypropylene mesh graft was used in one patient. 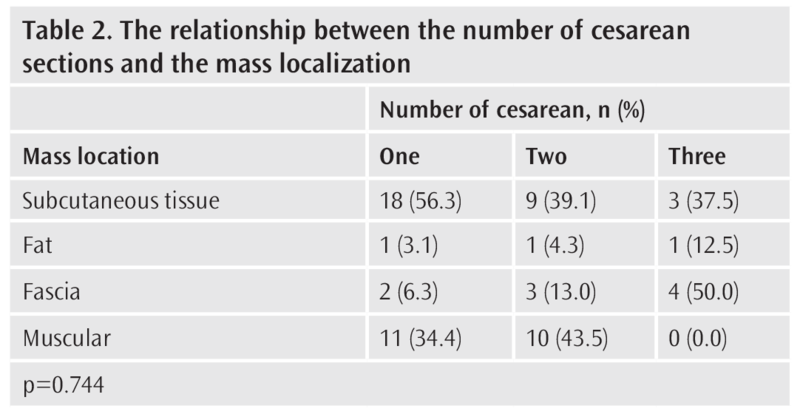 There was no statistically significant relationship between mass location and number of cesarean sections (p=0.744) (Table 2). There was no significant relationship between endometriotic mass size and the number of cesarean sections (p=0.197) (Table 3). Iatrogenic implantation theory is the most widely accepted theory for AWE. According to this theory, it is suggested that endometrial cells are planted directly at the incision (7,8). The development of endometriotic implants/masses mostly in previous gynecologic scars (such as cesarean section, hysterotomy, hysterectomy) supports iatrogenic implantation theory (6,9). Metaplasia and migration theories are other accepted theories in the development of extrapelvic endometriosis (9,10). Metaplasia theory claims that the differentiation of primitive mesenchymal cells into endometrial cells in the scar tissue causes endometriosis. The migration theory claims lymphatic or vascular spread of endometrial cells to distant sites. The nodules in previously non-operated patients or nodules in distant locations can be explained by this theory. None of these theories can exactly explain the whole case. Therefore, some researchers claim that genetic and environmental factors together play a role in the etiology of endometriosis (11). Cesarean section is one of the most common causes of AWE (2,6). The incidence of AWE in cesarean scar has been reported to between 0.03-1.08%. In the studies of Khamechian et al. (2) and Ding and Zhu (6), all patients had a history of cesarean section. AWE usually develops in women of reproductive age (10,12). Predominantly, the patients are multiparous. Palpable mass is seen in 63-100% and pain in 41-92.5% (2,6,9,13). The increase in mass size during menstruation is pathognomonic for scar endometriosis (9,14). In our study, most common finding was palpable mass (65%). In the differential diagnosis, hernia, suture granuloma, primary or metastatic tumors, sarcoma, cysts, nodular and proliferative fasciitis, fat necrosis, lipoma, abscess or hematoma of the abdominal wall should be considered (14,15). US, CT and MRI can be used in the diagnosis and US is the primary imaging method to be preferred. The endometriotic masses are mostly vascularized and hypoechoic sonographically. CT and MRI provide useful information about the anatomic location of the mass in the abdominal wall and its relation with neighboring structures for preoperative evaluation. However, imaging findings are not specific (12,16). Definitive diagnosis is possible only histopathologically (2,17). Some authors recommend FNA cytology before surgical excision. Observation of endometrial gland, stroma and hemosiderin-laden macrophages in cytology are considered diagnostic findings (15,18,19). On the other hand, there is no consensus for FNA, because there is some risk of planting endometrial cells to the puncture site (9,20). Local wide surgical excision is the primary treatment for AWE. For both treatment and reducing the risk of lesion recurrence, the mass should be widely excised with at least 1 cm margin (6,21). After surgical excision, defect can be repaired by using autologous or synthetic graft according to the width of the defect and its anatomical localization (11,22). Postoperative adjuvant hormone therapy such as danazol, progesterone and GnRH analogs are recommended for patients with concomitant pelvic endometriosis or recurrent AWE (21,23). The major limitations of our study were retrospective nature and failure of post-treatment controls due to inability to reach the majority of patients. Endometriosis should be considered in differential diagnosis of a painful mass in anterior abdominal wall, especially in women with a history of pelvic or obstetric surgery. According to our findings and the literature (2,4,6-14,24,25), previous cesarean section is the most well known risk factor in etiology. This suggests that the disease is highly caused by iatrogenic sowing. For this reason, the following recommendations will contribute to non-occurrence of AWE after cesarean sections; intraoperatively, a) rapid removal of the gauze used to clean uterine cavity and ensure no contact to the incision, b) replacement of gloves after uterine incision suturing, c) washing of the abdominal wall tissues with physiological saline after the uterus is closed, d) not using of remaining uterine suture materials elsewhere, e) irrigation of incision with physiological saline after the parietal peritoneum is closed. These recommendations can considerably reduce the incidence of AWE. Ethics Committee Approval: This study has been approved by İstanbul Training and Research Hospital Ethics Committee (decision no: 649, date: 15.05.2015). Informed Consent: Every patient admitted to our clinic had signed informed consent for admission. Author Contributions: Concept - B.H.B., H.Ö. ; Design - S.G.Y. ; Supervision - B.H.B., H.Ö., Resources - M.D., S.G.Y. ; Data Collection and/or Processing - B.H.B., M.D. ; Analysis and/or Interpretation - H.Ö., S.G.Y. ; Literature Search - B.H.B. ; Writing Manuscript - M.D. ; Critical Review - B.H.B., H.Ö. Accetta I, Accetta P, Accetta AF, Maia FJ, Oliveira AP. Abdominal wall endometrioma. Rev Col Bras Cir 2011; 38: 41-4. Khamechian T, Alizargar J, Mazoochi T. 5-Year data analysis of patients following abdominal wall endometrioma surgery. BMC Womens Health 2014; 14: 151-4. Jubanjik KJ, Comite F. Extrapelvic endometriosis. Obstet Gynecol Clin North Am 1997; 24: 411-40. Nominato NS, Prates LF, Lauar I, Morais J, Maia L, Geber S. Cesarean section greatly increases risk of scar endometriosis. Eur J Obstet Gynecol Reprod Biol 2010; 152: 83-5. Ideyi SC, Schein M, Niazi M, Gerst PH. Spontaneous endometriosis of the abdominal wall. Dig Surg 2003; 20: 246-8. Ding Y, Zhu J. A retrospective review of abdominal wall endometriosis in Shanghai, China. Int J Gynaecol Obstet 2013; 121: 41-4. Gunes M, Kayikcioglu F, Ozturkoglu E, Haberal A. Incisional endometriosis after cesarean section, episiotomy and other gynecologic procedures. J Obstet Gynaecol Res 2005; 31: 471-5. Horton JD, Dezee KJ, Ahnfeldt EP, Wagner M. Abdominal wall endometriosis: a surgeon’s perspective and review of 445 cases. Am J Surg 2008; 196: 207-12. Vellido-Cotelo R, Muñoz-González JL, Oliver-Pérez MR, de la Hera-Lázaro C, Almansa-González C, Pérez-Sagaseta C, et al. Endometriosis node in gynaecologic scars: a study of 17 patients and the diagnostic considerations in clinical experience in tertiary care center. BMC Womens Health 2015; 15: 13. Ecker AM, Donnellan NM, Shepherd JP, Lee TT. Abdominal wall endometriosis: 12 years of experience at a large academic institution. Am J Obstet Gynecol 2014; 211: 363. Jamabo RS, Ogu RN. Abdominal scar endometriosis. Indian J Surg.2008; 70: 184-7. Solak A, Genç B, Yalaz S, Sahin N, Sezer TÖ, Solak I. Abdominal wall endometrioma: ultrasonographic features and correlation with clinical findings. Balkan Med J 2013; 30: 155-60. Ozel L, Sagiroglu J, Unal A, Unal E, Gunes P, Baskent E, et al. Abdominal wall endometriosis in the cesarean section surgical scar: a potential diagnostic pitfall. J Obstet Gynaecol Res 2012; 38: 526-30. Kaplanoglu M, Kaplanoğlu DK, Ata CD, Buyukkurt S. Obstetric scar endometriosis: retrospective study on 19 cases and review of the literature. International Scholarly Research Notices 2014; 1-6. Pachori G, Sharma R, Sunaria RK, Bayla T. Scar endometriosis: Diagnosis by fine needle aspiration. J Cytol 2015; 32: 65-7. Hensen JH, Van Breda Vriesman AC, Puylaert JB. Abdominal wall endometriosis: clinical presentation and imaging features with emphasis on sonography. AJR Am J Roentgenol 2006; 186: 616-20. Cöl C, Yilmaz EE. Cesarean scar endometrioma: Case series. World J Clin Cases 2014; 16: 133-6. Medeiros Fd, Cavalcante DI, Medeiros MA, Eleutério J Jr. Fine-needle aspiration cytology of scar endometriosis: study of seven cases and literature review. Diagn Cytopathol 2011; 39: 18-21. Veda P, Srinivasaiah M. Incisional endometriosis: Diagnosed by fine needle aspiration cytology. J Lab Physicians 2010; 2: 117-20. Hughes ML, Bartholomew D, Paluzzi M. Abdominal wall endometriosis after amniocentesis. A case report. J Reprod Med 1997; 42: 597-9. Chiang DT, Teh WT. Cutaneous endometriosis. Surgical presentations of a gynaecological condition. Aust Fam Physician 2006; 35: 887-8. Kokuba EM, Sabino NM, Sato H, Aihara AY, Schor E, Ferreira LM. Reconstruction technique for umbilical endometriosis. Int J Gynaecol Obstet 2006; 94: 37-40. Wang PH, Juang CM, Chao HT, Yu KJ, Yuan CC, Ng HT. Wound endometriosis: risk factor evaluation and treatment. J Chin Med Assoc 2003; 66: 113-9. Wasfie T, Gomez E, Seon S, Zado B. Abdominal wall endometrioma after cesarean section: a preventable complication. Int Surg 2002; 87: 175-7. Teng CC, Yang HM, Chen KF, Yang CJ, Chen LS, Kuo CL. Abdominal wall endometriosis: an overlooked but possibly preventable complication. Taiwan J Obstet Gynecol 2008; 47: 42-8.